Folks, it’s been two whole days since the weekend, and I’m still tired from all the anticipation, preparation and nervousness. As I’ve told numerous people, STEAM is every bit as hectic as people have been saying since I visited last year’s event. Sadly it’s all over for another year, and we’re all plunged back to reality… until the next event! As usual I did my thing and took photos of just about every exhibit at the event, on top of having my own display and filming the talks – as well as giving a talk on Project Swapfig. There were all kinds of models on display, from the deceptively simple to the outright insane, and you’ll find many examples of them in my Flickr set, as well as on Flickr. Videos of the talks will hopefully be uploaded later this week: unfortunately, due to a lack of preparation on my part, I couldn’t get all of the footage of the talk on ReBrick (the last two minutes were cut off). If I was pressed to choose a favourite display, it would probably be this one, mostly because of the architecture and the presence of [custom-painted] white “nanofigs”: this is the kind of thing I’d really like to build, if I had the knowledge. That said, nothing I’ve said should take away from anybody else or their exhibits, which were all amazing in their own rights. I don’t know about you, but I’m already thinking about my next big build, including this year’s annual Winter Village model and possibly my next display piece for whatever comes up in the near future. 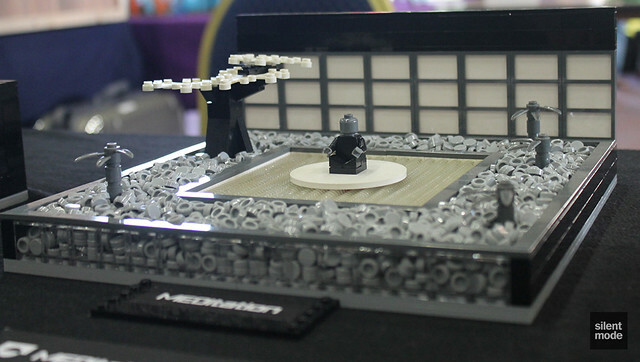 Perhaps there’ll be The LEGO Show 2014 (I sure hope so), or I may take my talents to Yorkshire for their event next year. Who knows? So watch this space for the talks from STEAM 2013, and I’d like to thank Brickish and the people behind the event for agreeing to have this lunatic exhibit with them.